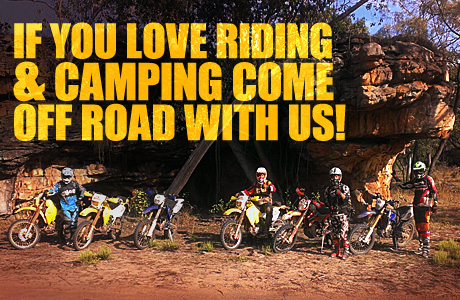 If you love getting amongst it and riding a dirt bike over corrugated gravel roads, narrow winding tracks, through river and creek crossings, over rough & rocky outcrops, braving the elements through sand and bulldust, fishing, swimming in pristine water holes and sleeping out under the stars in remote camps all set amongst the rugged beauty of Western Australia's remote Kimberley region, then KIMBERLEY TRAIL BIKE ADVENTURE TOURS IS FOR YOU! Copyright © 2019 Kimberley Trail Bike Adventure Tours. All rights reserved. Design by Topic Visual - Development & Hosting provided by You Solutions.